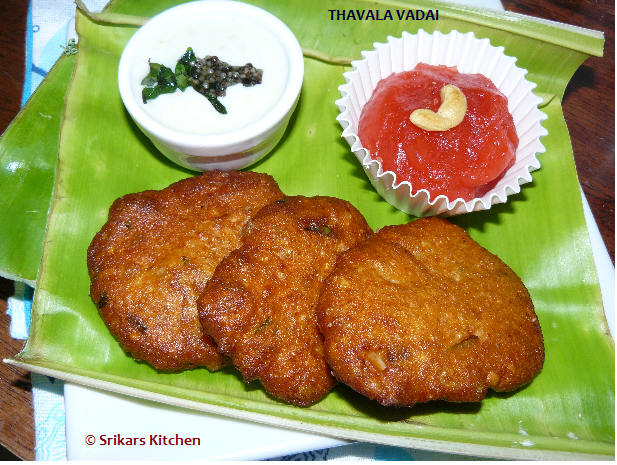 Thavala Vadai- This is a famous South indian special especially from Tanjore District. 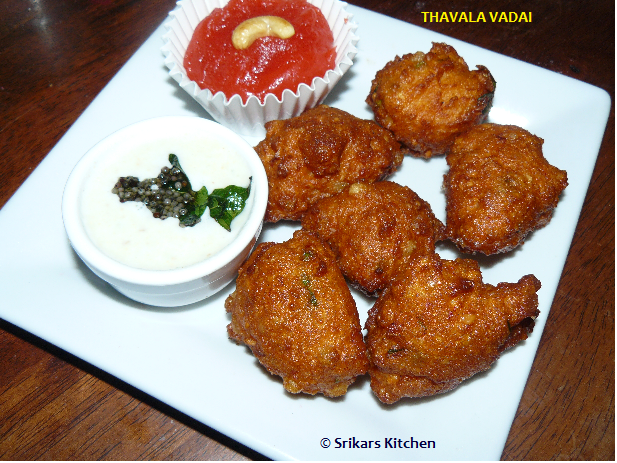 Normally During Navrathri season or rainly season this special vadai is made. Still I remember, I had this Vadai in my Wedding . They pepared this Thavala vadai with Ashoka halwa for evening snacks on Mappilai azhaippu day, But I Couldn't eat properly on that day. just i tasted it. Grind rice, red chillies together to a almost fine paste. Grind channa dal, thuvar dal,urad dal to a course paste & add to the rice mix. Stain the water in the moong dal , sago & add to the rice mix. Add chopped coconut, salt, curry leaves, coriander leaves, hing & mix well. Heat oil in separate pan. Take a banana leaf or plastic sheet, grease with little oil on it using with finger,flatten the vada mix to round shape and deep fry, . Cook both sides until golden brown & drain in a greaseproof paper. Serve hot with coconut chutney or Ashoka halwa or both. Alternatively use a small laddle of the vada mix & deep fry it. Congrats on your 300 th post, very very tempting halwa and beautifully made crispy and delicious vadai. Super platter and very nicely made. Love this recipe. my fav. thanks for sharing the authentic recipe.looks perfect for snack.how long should you soak them. Thank you meena. Soak rice, dals and sago separately for 2 hours min.